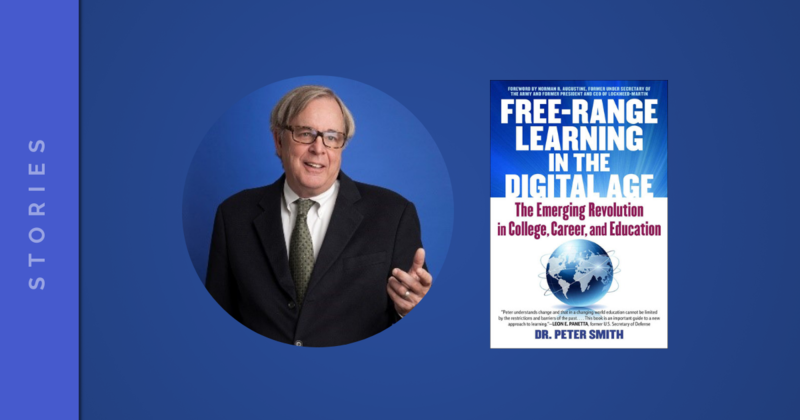 In January, I had the pleasure of interviewing Peter Smith, Ed.D., Orkand Chair and Professor of Innovative Practices in Higher Education at the University of Maryland University College (UMUC). We discussed his new book, Free Range Learning in the Digital Age: The Emerging Revolution in College, Career and Education. Free Range Learning covers changes in the college student population, technology, and the power of recognizing learning, regardless of where it occurs. Through student stories, interviews with leading colleges that serve adults, and his experience in policy and higher education, Dr. Smith offers a view into working adult students, and their challenges and triumphs. He also gives advice and possible solutions to better serve them. In the following, I have included a few highlights from our conversation. Please check out the full video also linked below. Please share if you know an adult student, or are an adult thinking about returning to college to earn a degree. Free Range Learning in the Digital Age is a great resource for adults and colleges. Also, Saylor Academy, which is mentioned in the book, can help students earn free college credit, and help colleges support student success. Free Range Learning details several stories about adults who pursued a self-led return to higher education. All of the stories had a similar “character arc”. In each story, nearly every student had a “traumatic” exit or “breakup” with higher education. Later on, each student found they had talent and were able to learn and do well on her or his own professionally. However, they were “stuck” at their current job or position, which Smith calls a turning point. Once the student realized they needed a degree, they developed a plan to have their learning recognized. Finally, each student became self-empowered once his or her learning and experience was acknowledged. Each student was a very talented adult on their own. However, they needed a “turning point”, a chance to change, and a college that was flexible enough for their needs. I asked Dr. Smith to predict how higher education will have to change to accommodate adult students and their vast experiences. He argued two main factors were needed. First, colleges should create more broad prior learning assessment options to students, so they can use their work and training experiences to graduate more quickly. Second, colleges should offer comprehensive student supports, including financial needs and career information, to help them make good choices. In Free Range Learning, Dr. Smith argues the skills gap and the credential gap are related. In addition, I would include the “communications gap”, or theory that candidates are not able to communicate their skills in ways that employers recognize, as related to the same issue. These “gaps” leave talented potential employees out of the hiring pool. Employers and hiring managers will have to communicate the needed skills, intellectual capabilities and behaviors that they want jobseekers to have to fit into their companies in order to close them. In addition, we need more flexible ways to measure talent and knowledge, more potential job seekers can be considered. Also, to create a better match between education and employment needs, universities and employers will need to work together more closely. One way colleges can become more adult-friendly is by granting credit for the various forms of alternative credit linked to college-level learning outcomes. For example, Prior Learning Assessment, where intensive training, learning, and work experiences are tied to college curricula, is one such form. Credit-by-exam, where students take an exam to show knowledge equal to that earned in a college course, is another. Credit for prior learning and credit-by-exam can often complement each other in helping adults complete their degree. Saylor Academy’s free college courses are designed around college-level learning outcomes and recommended for college credit by the American Council on Education. Our flexible and self-paced courses are perfectly suited for online learners, and we work with several of the nation’s leading adult-serving colleges and universities. Our courses are a flexible, cost-saving way to help dedicated learners onboard into, move through, or return to your degree program. Contact Jacqueline Arnold, Manager of Strategic Relationships and Communications, at [email protected] for more information. Subscribe to stay up to date on our latest blogs.